Congrats to the winner, Tracey! 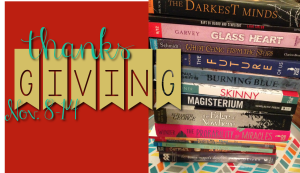 Again, I’m GIVING away a ton of Young Adult and Middle Grade books (with a few Adult novels) this November to show my THANKS! There are a few authors that have donated their own novels in thanks, and I hope you are able to make some new connections. The cool thing about this giveaway is that I’ll be picking one winner each Friday, and the winner will be receiving 12 (or more) books as the prize! I will be shipping to any U.S. address, so spread the word and get your friends to enter. I never said you couldn’t share.